What are the best Smartphone Tripods? If you want to give your videos a professional look a tripod is an essential buy. Video that is stable and well framed always looks better than a chaotic roaming hand-held shot. If you watch any BBC documentary you will see that nearly every shot filmed is static or with a slow tilt or pan. They do this so you as a viewer don’t get motion sickness trying to watch a wobbly camera. This is not to say that hand-held shots don’t have their uses but in general your videos will look better if you mount your Smartphone on a tripod or portable monopod. If you don’t have a tripod your shots can radically improve by leaning up against a wall, sitting on a bench or doing anything that gets the camera static. It is nearly always better to keep the Smartphone still and let the action happen in front of it. Believe me, your audience will appreciate it and your final video will look more professional. If possible though, you should use a tripod to stabilise your video. 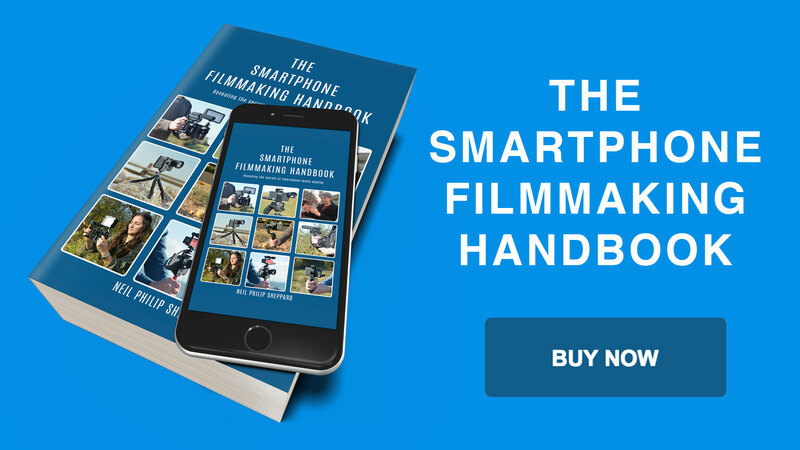 Luckily there are many tripods and monopods on the market that will help you achieve decent results when filming with your Smartphone. 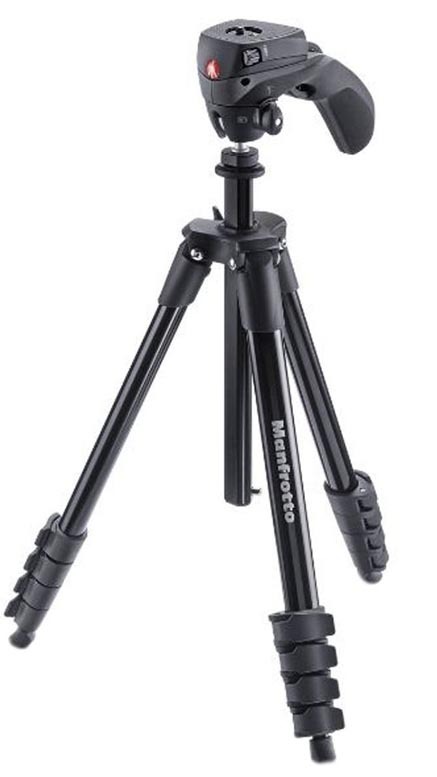 The Compact Action Black Tripod is a low cost tripod from Manfrotto. 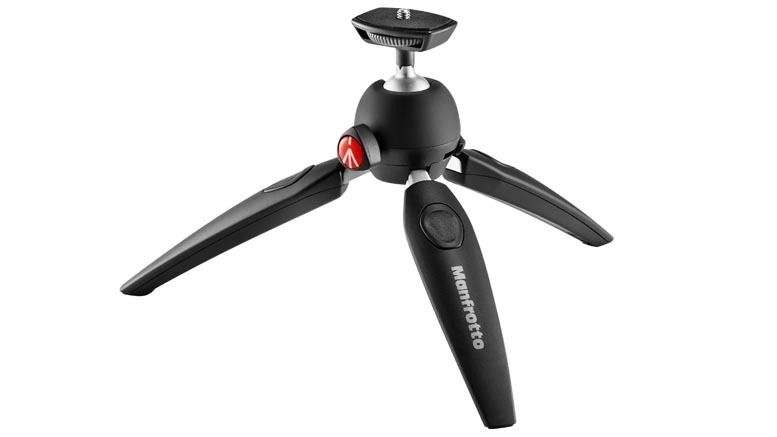 Manfrotto has a good reputation for its various tripods and monopods and has a huge selection of tripods available. This particular model’s design is for DSLRs but it will work well with any Smartphone. It weighs in at a respectable 1.201g, which means it is light and portable. Its collapsed height is 453mm so it’s small when kitted down. The maximum height with the centre column up is 1550mm so it should be high enough for general shooting. If you need to move your Smartphone off the Action Black in a hurry there is a circular quick release plate so you don’t have to use screwdrivers or coins to undo any screws. For panning and tilting there is an ergonomic joystick head with a scroll wheel for locking it in place. The head itself is smooth but don’t expect too much at this price. If you are on a low budget this tripod should be fine for most tasks. It also comes in three different colours including black, white and red. The Slik 504QF II Video Tripod is excellent value for those who are looking for a low budget tripod for Smartphone filmmaking. It weighs about 2.570g, which means it is light and won’t be giving you backache when you are carrying it around all day. Its collapsed height is 690mm, which means it shouldn’t be too much of a burden when strapped around your kitbag. The full-extended height is 1506mm and it can go as low as 450mm for those difficult floor shots. On the feet there are rubber shoes but there are no spikes. This does mean that in rough ground you may loose stability but this shouldn’t be too much of a problem. There is also a centre column if you need to get a bit more height. 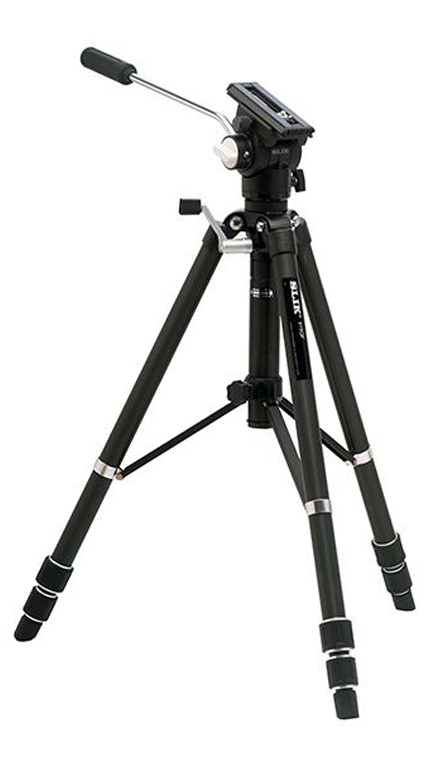 The video pan head on Slik 504QF II Video Tripod has an extra long adjustable control handle that provides a smooth fluid motion when panning and tilting. It also comes with a three-way head that will be able to handle most filmmaking tasks. While it is not the smallest tripod when collapsed it is a good all-round performer, which will give you many years of practical use. 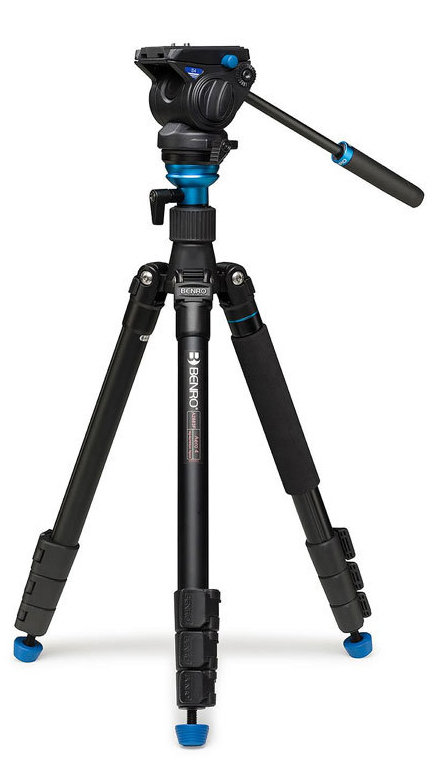 The Benro Aero 4 Tripod is more expensive than some of the other tripods described here but it is a quality piece of equipment that will handle most filming tasks. It has a weight of 1.900g so it’s not too heavy to carry and light in weight. Its got a maximum height of 1651mm and when fully collapsed will pack down to about 465mm. This means it won’t be too difficult to carry around when travelling. There are also spikes that can screw down from the rubber feet, which will give you that extra stability if you find yourself on rough ground. 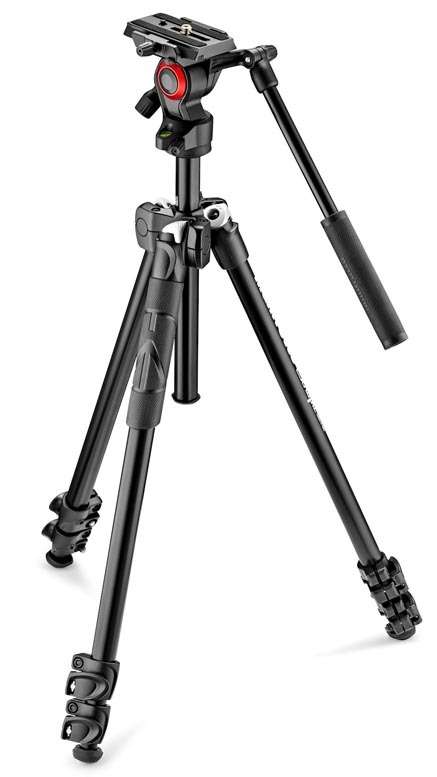 The design of the head of Benro Aero 4 Tripod is specific for video filming with separate pan and tilt adjustments. This means it will move smoothly to give you good panning and tilting shots. 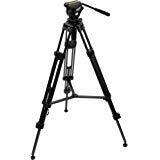 This tripod is a made of tough aluminium and you can remove one of the legs to give you a monopod if needed. It also comes with a padded bag with strap so you can easily sling it on your shoulder for carrying to your next shoot. If you want spend a little more on a tripod than Manfrotto’s Action Black then the Manfrotto 290 might better suit your needs. 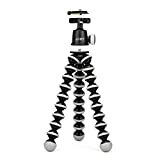 Aimed at the video blogger and mobile journalist this tripod has a quality design with innovative touches and sturdy durability. The video head gives smooth pan and tilts that will give a professional finish to your videos and should put up with most filming tasks that you can think of. This is the smallest and lightweight video tripod head in the Manfrotto range and it has a dedicated sliding plate to help balance your Smartphone. The pan and tilt head also has fluid drag, which makes it incredibly smooth. The tripod itself is extremely portable and weighs just 0.38kg so it won’t weigh you down too much when you are out location filming. This Manfrotto 290 has a compact and lightweight design, which combined with the head is easy to pack away and carry. The legs feature aluminium tubes, which are sturdy and rigid when up and should give you peace of mind when in windy conditions. The leg locks are aluminium, which means when you lock the legs in place they will hold firm without slipping. A,t the bottom of the legs are rubber leg warmers that help to keep the tripod firmly in place when standing. 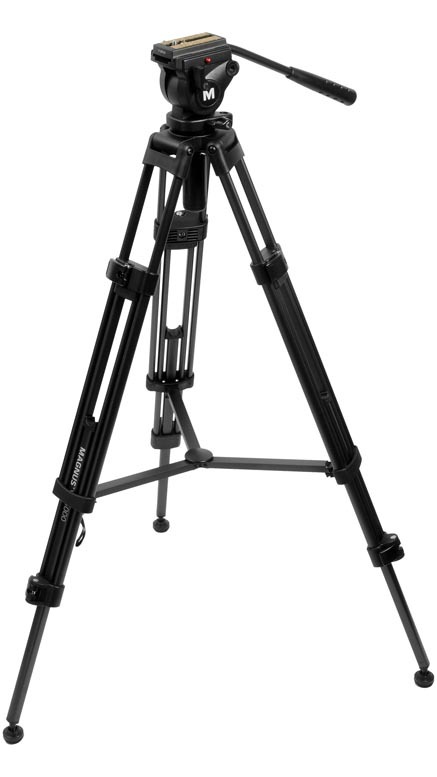 The Magnus VT-4000 is a tripod for serious video work. It weighs 3.62kg but can carry a weight of up to 3.99kg so it should easily be able to support your Smartphone and any extra equipment you may have attached. The head comes with a panning handle, which attaches to the right side of the head. This will be able to accommodate any panning or tilting shots you may wish to do. You can also take the handle off and move it to the other side if needed. However you cannot remove the tripod head like on some other tripods as it is attached to the legs. There is a set of dedicated lock switches to lock the head in place if you need to. 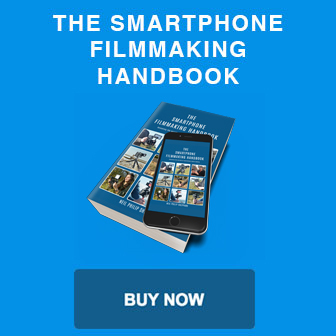 These can be helpful if you only want to concentrate on one particular camera move. Added to the head is also a fixed counterbalance spring mechanism, which gives a 1.5kg of counterweight for smooth titling movements. There is also a bubble-level to help you get level on rough ground. The quick release plate on the head has a double-lock feature which snap-locks when you push the plate in place. This will keep your Smartphone safe and secure when moving around. If you need to remove the plate in a hurry you just push the red button, which unlocks it and releases your Smartphone. The VT 4000 tripod is made of anodised aluminium which gives it a sturdy build quality and it should put up with most filming tasks you may face. It is also not too heavy if you need to carry it. At full height it will reach 59 inches, which should be tall enough for most purposes. 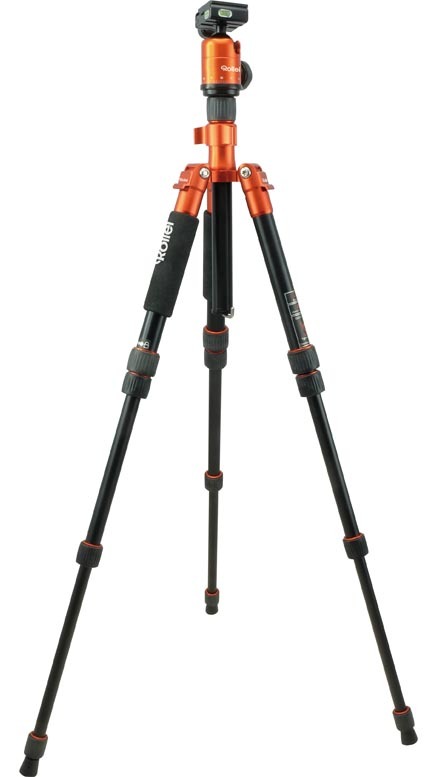 On the bottom of the legs the VT 4000 tripod has retractable spike feet, which can be useful when you are in rough terrain. When you move inside you can simply put the spike feet back up and let the rubber feet take over so you don’t risk scratching the studio floor. The Rollei Traveler No.1 is a compact tripod that is perfect if you are planning on adventure trips. It is lightweight and weighs just 1kg so will tuck easy away into your backpack for long-distance walking. It is made of carbon fibre and this makes it lightweight as well as strong. It also has the advantage of being able to convert to a monopod. So if three legs are not your style you can always go down to one. 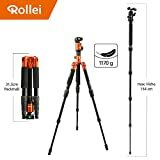 The Rollei has a maximum height of 56 inches, which should be high enough of most tasks and if you want to get low to the ground it can go as low as 13 inches. When you pack the Rollei away it will pack down to just below its lowest height of 13 inches. So it won’t take up too much room in your backpack. The maximum weight the Rollei can carry is 8kg, which is above average for a tripod of this size. This should be enough for your Smartphone and any extras you might want to attach. The quick release legs should set up with out much bother and on the bottom of these are metal spikes, which you can reveal by twisting the rubber feet. This is a bonus if you need to set the tripod up on rough terrain. The aluminium head will put up with any knocks that may happen and you can turn it 360 degrees if you need to get a good all-round view. The Joby GorrilaPod 3K Kit can carry a good amount of weight. Its primary design is to support a heavy DSLR camera and its lens. This means it has increased stability compared with other Gorrilapods. It can support a total weight of 3kg, which may not be as much as a tripod but is impressive in a GorrilaPod. With this added support it should easily be able to keep your Smartphone from toppling over. 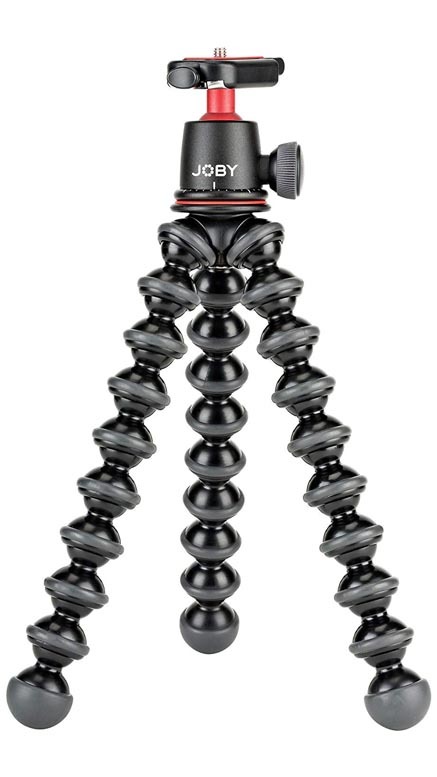 The three legs of the GorillaPod can bend, twist and rotate 360 degrees and have a rubber coating, which means they won’t slip on most surfaces. This is great if you are setting it up on a desk to do a video blog into your Smartphone. You can also twist the legs into multiple different positions if you need to get your Smartphone into awkward places. The legs can be a little stiff to move but this helps to keep it stable and keeps the Joby upright. When you stretch out the legs fully it should reach a maximum height of 9.8 inches. There is also a bubble level found on the head of the GorrilaPod 3K Kit . This is great in helping you get level shots with your Smartphone. You can tilt up the ball head to 90 degrees and rotate 360 degrees for panoramic shots. On top of the head is a quick release plate so if you do need to remove your Smartphone in a hurry you can easily detach it from the GorrillaPod. Another great way to use the GorrilaPod is to fold two of the arms out to the sides and fold the middle one beneath the head plate. 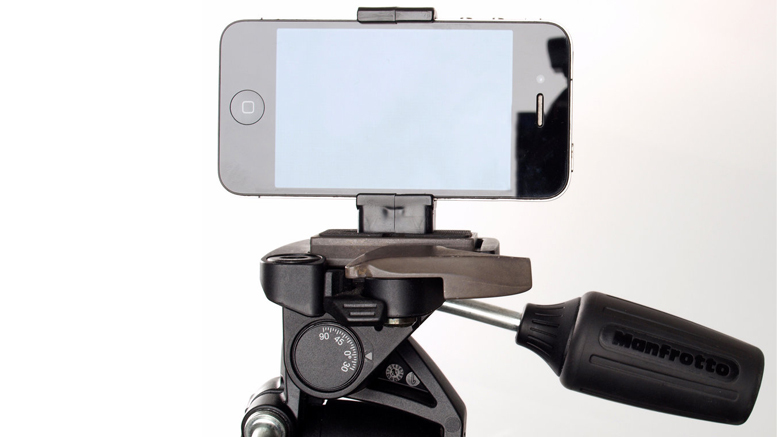 By doing this you can convert the GorrillaPod into a hand-held Smartphone stabiliser. This is great for doing hand-held shots and will give you better stability than just holding your Smartphone. The Manfrotto Pixi Evo Mini Tripod comes in three colours red, white and black, just like its larger brother the Manfrotto Action Tripod. Each colour features a matte finish made of a high-grade plastic that is also scratch resistant. So no matter what you get up to with the Pixi Evo it is always going to look good. The Pixi Evo can support a maximum weight of 2.5kg, which should support your Smartphone with ease and have enough extra capacity for any additions you might want to add. Unlike its predecessor the Pixi Mini, the Pixi Evo now features a ball head. This can rotate to all angles so you can easily get the perfect shot with your Smartphone. Another welcome edition is the extendable legs. So although this is a mini tripod you now can get a little extra height if you need it. There isn’t much rubber on the feet though so it might slip on some surfaces. Also unlike the GorrillaPod you can only use the Pixi Evo on flat surfaces. That said it packs down to a small compact size, which will tuck into your backpack with ease when travelling.